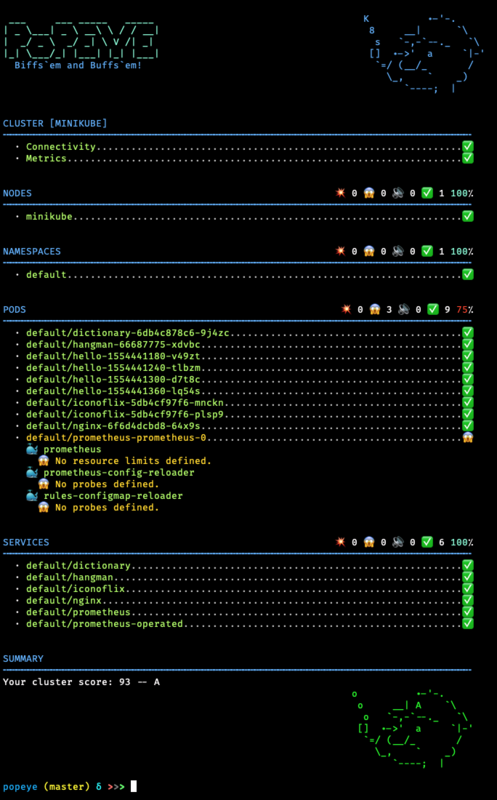 Popeye is a utility that cruises Kubernetes cluster resources and reports potential issues with your deployment manifests and configurations. By scanning your clusters, it detects misconfigurations and ensure best practices are in place thus preventing potential future headaches. It aims at reducing the cognitive overload one faces when managing and operating a Kubernetes cluster in the wild. Popeye is a readonly tool, it does not change or update any of your Kubernetes resources or configurations in any way! Popeye is available on Linux, OSX and Windows platforms. Binaries for Linux, Windows and Mac are available as tarballs in the release page or via the SnapCraft link above. 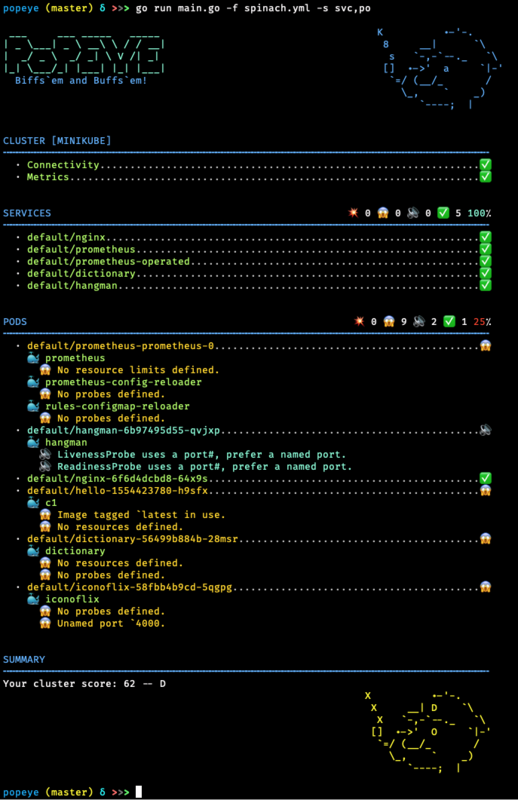 Popeye scans your cluster for best practices and potential issues. Currently, Popeye only looks at nodes, namespaces, pods and services. More will come soon! We are hoping Kubernetes friends will pitch'in to make Popeye even better. Here is a list of sanitizers in place for the current release. You can use Popeye standalone or using a spinach yaml config to tune the sanitizer. Details about the Popeye configuration file are below. # Popeye a cluster using your current kubeconfig environment. # Popeye uses a spinach config file of course! aka spinchyaml! # Popeye a cluster using a kubeconfig context. NOTE: This file will change as Popeye matures! # Limits set a cpu/mem threshold in % ie if cpu|mem > limit a lint warning is triggered. # CPU checks if current CPU utilization on a node is greater than 90%. # Memory checks if current Memory utilization on a node is greater than 80%. # Exclude lists node names to exclude from the scan. # Exclude list out namespaces to be excluded from the scan. # Restarts check the restarts count and triggers a lint warning if above threshold. # Check container resource utilization in percent. # Issues a lint warning if about these threshold. # Excludes these services from the scan. You're running older versions of Kubernetes. 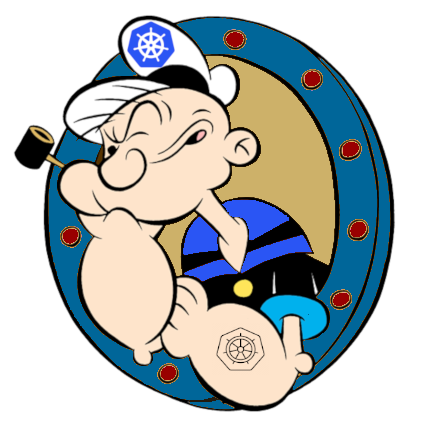 Popeye works best Kubernetes 1.13+. Your cluster does not run a metric server. In order for Popeye to do his work, the signed in user must have enough oomph to get/list the resources mentioned above as well as metrics-server get/list access. This is work in progress! If there is enough interest in the Kubernetes community, we will enhance per your recommendations/contributions. Also if you dig this effort, please let us know that too! Popeye sits on top of many of opensource projects and libraries. Our sincere appreciations to all the OSS contributors that work nights and weekends to make this project a reality!